This Positivity Pregnancy Bracelet is so pretty, you wouldn't guess there was hidden meaning behind the stones and charm! I truly believe every little positive thought makes a difference. That's why I created my fertility jewelry line. This is a perfect gift for someone you know who has been trying, or a gift for yourself. Aventurine is known as the lucky stone with a positive influence over growth and fertility. It is considered a healing stone and may soothe a troubled heart or calm distraught emotions. Aventurine opens the heart chakra, may soothes physical and emotional pain. It may help to heal the heart by releasing emotional stress. Aventurine may help with emotional pain, fear, and negativity, promotes physical, mental and emotional well being. These qualities may help with having a trouble-free pregnancy. Moonstone may help you welcome a new soul into your body and is said to have powers that aid in balancing of your emotions, very important in trying to conceive! It may help calm emotions, opens up ones feminine side. It may help heighten intuition and receptivity. Moonstone may assist with hormone equilibrium during menstrual cycle. Moonstone also may help to encourage love, hope, and fertility. Rose quartz are known as the beads of love, peacefulness and emotional healing. It may help soothe the heart, bring peace, balance, compassion and kindness. It may help to encourage acceptance and promotion of inner peace, to bring back emotional balance. Rose quartz also may help reduce stress and improve hormone flow. May aide in opening to the goddess within and may help to heal heartache and loneliness, and helps us love and accept ourselves. Measures 7.5 inches in length. "Not only did my friend love the bracelet, she found out she was pregnant just a few weeks after I bought it for her! Good luck indeed. :o)"
"After watching a reality show participant speak of finally getting pregnant after receiving a fertility bracelet from a family member, I decided to do some research on the matter. My search came back with a handful of companies providing such bracelets, but one that really stuck out and seemed the most heartfelt, was the Fertile Garden. 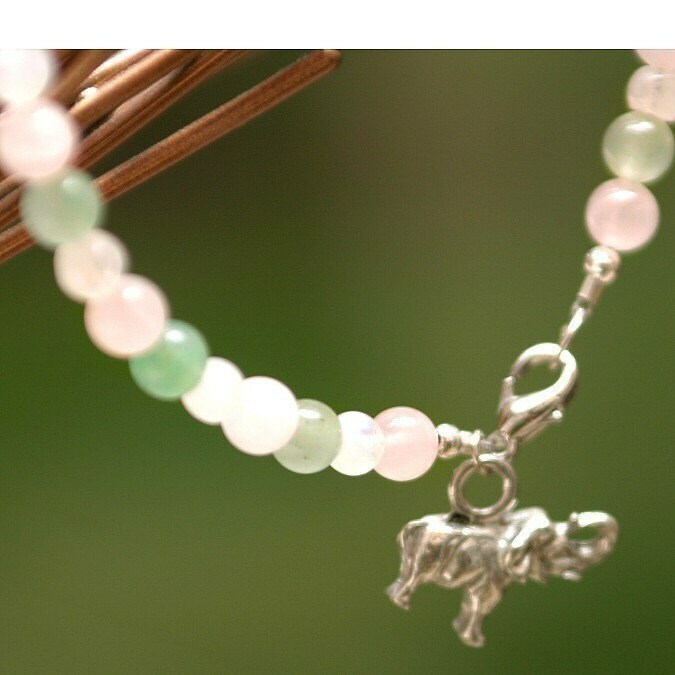 I ordered a fertility bracelet with moonstone, amethyst and rose quartz crystals with butterfly accents and a turtle clasp and it was very affordable and came quickly. There was a handwritten note on a beautiful card, wishing me congratulations. That really stuck out, as you never see that with vendors today. The bracelet was so beautiful and I put it one instantly. I had my IVF transfer the next day and even though they only transferred one egg, two weeks later, I was pregnant. By the way, I am over 40! I rarely remove this bracelet... only to shower, but I feel down deep that this was made with magic and care and really did help me to get pregnant!" "Perfect! Thank you! Your bracelet worked for me in October!" "I'm so excited to get my bracelet as a friend got one a few weeks ago and she got her first ever BFP after 5 years of trying." "I ordered a bracelet from you for a friend a few months ago and she was able to conceive 2 months later!!!"